PINZBOHR introduces a new lightweight tools line that allows boring diameters from 220 mm up to 1020 mm. MACROBOHR is a modular system based on interchangeable plates of various lengths made of aluminum, thereby reducing the tool weight in large diameter applications. The boring head features a high precision adjustment through a graduated dial with a read out precision of 0.002 mm and fixes the aluminum plate by axial pressure tapered screws, providing high rigidity to perform a stable boring and avoid vibrations. 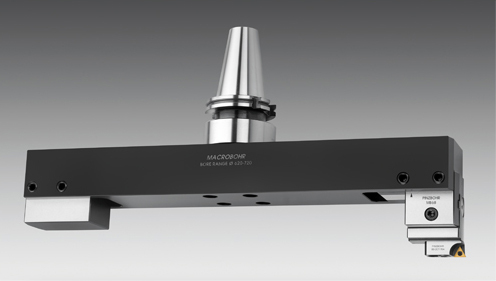 MACROBOHR allows using the same arbor, boring head and counterweight in the different aluminum plates, becoming a versatile, light and reliable system.